Double edge safety razor with smooth imitation ivory handle and chrome plated razor head. Comes with 5 derby safety blades. 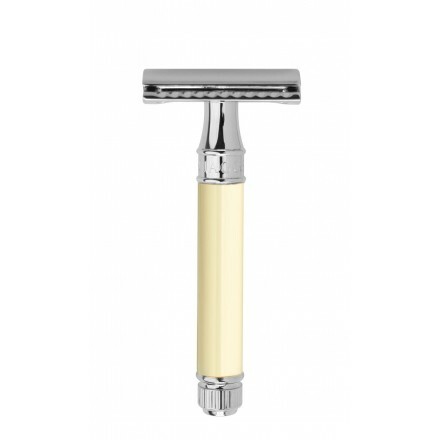 Introduced in the 1890's and now extremely popular with experienced wet shavers. The flat stainless steel blade, sharpened on both edges, offers a simple but effective single cutting action similar to that of an open cut throat razor. Traditional safety blades (double edge blades) are available from many supermarkets and pharmacies and are inexpensive.